One of our favorite places to visit is Beaches & Cream at the Beach Club Resort. 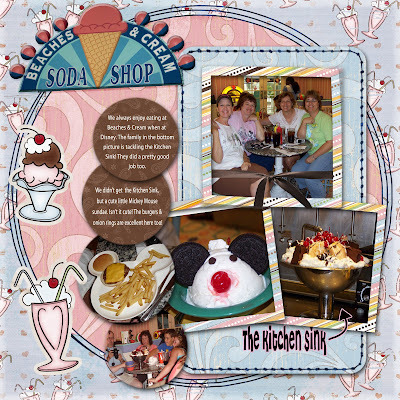 They have wonderful hamburgers & onion rings, but they are famous for The Kitchen Sink. It is about eight scoops of ice cream, chunks of brownies, pound cake, oreo cookies, marshmellow cream, a whole can of whipping cream, a handful of cheeries & a sprinkle of nuts (optional). The family in the lower picture did a pretty good job of finishing this! Great job Cheryl! Feeling better yet?